Freshness & Safety: F&S Produce focuses on food safety and qualty with SQF Level 3 certification. Let’s Move! Salad Bars: Donated salad bars chip away at goal of 6,000 in three years. New Markets for European Fresh-Cuts: Italian processor moves beyond sliced and diced. Promoting Produce: Can produce ads get the desired results? USDA Updates Dietary Guidelines: Recommendations include greater fruit, vegetable consumption. 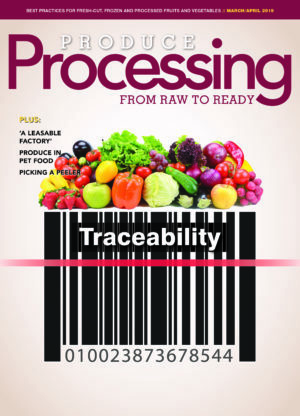 From Farm to Fork: Distributors find some returns from traceability investment. United Fresh 2011: The Big Easy hosts one of produce industry’s largets shows. Sustainable Energy: Gills Onions adds to its sustainable power initiative. Growing the Organic Niche: Studies: Organic market not hurt by recession. Improving Carrots: Ultraviolet light boosts carrots’ antioxidant value. Florida Freeze: Low temps hit Florida growers with major losses. Florida Water Rules: West Florida fruit growers face cold weather challenges. Behavior Change Through Video Games: Study finds fruit and vegetable consumption can be increased using video games. Green Packaging: Mature market estimated to grow over next three years. Radishes & Red Celery: Duda Fresh launches products that were years in the making. Fresh-Cuts Rebounding: Latest figures show convenience items regaining sales. Leafy Green Safety: Arizona project seeks to improve safety of organic leafy greens. Champion for Ag: Debbie Stabenow to lead Senate Agricultural Committee. East Coast Fresh Cuts: Retail products fueling growth westward. Bipartisan Politics: Child nutrition, food safety bills fail to pass by election break, but they’re not dead. A Slice of the Market: CrunchPak expands facilities, rolls out new products and promotions for its 10-year anniversary. FreshRinse: Groundbreaking technology is breakthrough for food safety, Fresh Express says. Status Check for Food Safety: PMA’s Whitaker advocates for teamwork between sales and food safety. The October 2010 issue of Fresh Cut is online. Organics in 2010 Organic sales experienced tremendous growth, but the market began to stabilize in 2008 at high levels of consumer acceptance and use, according to the State of the Organic Consumer 2010 study, released by the Hartman Group in April. About 75 percent of consumers use organic products, and about one-third of those use organics at least monthly, and that hasn’t been affected by the economy. Packaging Potatoes In an effort to meet changing consumer demands and lifestyles, L&M Cos. is expanding its microwaveable potatoes to include sweet potatoes, and has introduced new packaging for their microwaveable russet potatoes. Your Salad Story The biggest name in fresh-cut salads is entering a new era in its business practices – one of trust and connecting with consumers. I-9 Issues In June 2009, the Department of Homeland Security’s Immigration and Customs Enforcement (ICE) agency issued 650 I-9 audits, more than in all of 2008. In November, ICE issued another 1,000 audits. PACA for Processors Jerr Brandel is tired of what he calls “bait and switch” tactics in the fresh-market produce industry, and he wants to see them stop. At the very least, he wants growers to take more control of the prices they get for their crop. Pero’s Salad Cut Ups There big changes happening at Pero Family Farms; not the least of which is the new company name.